If the British Empire was built on the playing fields of Eton, United States world hegemony gets its training in Hollywood studios and advertising agencies. Selling your product, or yourself, by looking sincere is a cultivated American art. Current top U.S. leaders are expert practitioners. Last August 8, on that serious think tank the Charlie Rose show, former acting CIA director Michael Morell said that U.S. policy in Syria should be to make Iran and Russia “pay a price”. Russians and Iranians should be killed “covertly, so you don’t tell the world about it”, he said. Morell proposed that U.S. forces begin bombing Syrian government installations, in order to “scare Assad”. Probably angling for a good job next year, he is on record supporting Hillary Clinton as a “highly qualified commander in chief” and a “strong proponent of a more aggressive approach” in Syria. Then, on Saturday, September 17, the U.S. Air Force did exactly what that CIA insider had called for. In sustained air strikes, four U.S. jets bombed a key Syrian Army position that had been defending the town of Deir ez-Zor from ISIS/Daech fighters. More than sixty Syrian soldiers were killed and over a hundred wounded. Daech forces immediately took advantage of the strikes to overrun the government position. In effect, the U.S. Air Force acted as air cover for the Islamic fanatics U.S. to advance against the legitimate army of Syria. This was not only a violation of the cease-fire painstakingly worked out by Russian foreign minister Sergei Lavrov and U.S. Secretary of State John Kerry. It was an open military aggression by the United States on the territory of a sovereign state. The Russians immediately called an emergency session of the United Nations Security Council to respond to this deadly violation of the truce supposedly intended to facilitate peace negotiations and humanitarian aid. When Russian ambassador Vitaly Churkin took the floor to speak, his American counterpart, Samantha Power, draped in her long red mane, walked out to give a press conference that clearly illustrated the difference between Russian and U.S. diplomacy. Churkin, like Lavrov a few days later, cited facts and analysed the situation rationally. Samantha Power put on a show of evasion and insults. Why all the fuss? was her opening theme. After all, we halted the attack when we were informed that “it was possible we might be hitting Syrian regime personnel and vehicles”, she stated, adding that “if” we did so, “that was not our intention”. That should settle the question; who could believe that the United States might deliberately attack the regime their politicians have been saying “must go”? “Even by Russia’s standards, tonight’s stunt – replete with moralism and grandstanding is uniquely cynical and hypocritical”, she declared. Samantha Power, that conniving arriviste whose carefully constructed career has been built on moralism, grandstanding, cynicism and hypocrisy, had all the nerve in the world to turn these epithets against the prime target of her own habitual moralism, grandstanding, cynicism and hypocrisy. If the air strikes hadn’t been enough to destroy Russian confidence in dealing with the United States, Samantha Power’s contemptuous reaction was sure to do the trick. 1/ While good-hearted bumbling America occasionally kills a few people by accident, the others do it all the time and above allintentionally. 2/ Killing civilians is what war is all about. War is not about battles between armed forces for control of territory. It is not about geopolitical power struggles. It is about “civilian victims”. At the close of her stunt, grandstanding and scoring cheap points, Samantha Power exhorted Russia “to stop the cheap point scoring and the grandstanding and the stunts and focus on what matters, which is implementation of something we negotiated in good faith with them.” Good faith? They are supposed to believe we negotiated “in good faith” an agreement which we just flagrantly destroyed? In the U.N. Security Council this time, John Kerry took the stage. Again, the critical point was the contrast between what we certainly did and what they allegedly did. Yes, we committed “a terrible accident”. But what they (allegedly) did was worse. “I got to tell you, people running around with guns on the ground, from the air, is a very different thing from trucks in a convoy with big UN markings all over them,” Kerry declared. He was implying that the difference was between an understandable accident, whose victims were “running around with guns”, and an attack on civilians. Yes, but in war, attacking soldiers is the whole point. It can make a difference in the outcome. Hitting an aid convoy is “collateral damage”, as the U.S. calls it when the bombs are American. 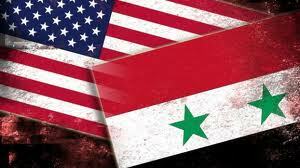 By bombing Deir ez-Zor, the United States was taking part in a war in which Syria is fighting for its life. It cannot be ruled out that Syrian forces attacked the aid convoy because the truce was already broken at Deir ez-Zor and they believed it concealed weapons being transported to Daech. Such things happen. Or the attack could have been carried out by rebels as an act of propaganda, a “false flag”, designed precisely to be used to accuse the adversary. Such things also happen. It has already been established by careful research that the notorious Al Ghouta chemical weapons attack, attributed to Assad, was almost certainly carried out by rebels precisely in order to incite the United States to cross the “red line” set by President Obama and bomb Damascus. The War Party which by now controls the Pentagon, much of the State Department, most of Congress, as well as leading media and think tanks, has been castigating Obama ever since for not having seized that opportunity to wage a full-scale “regime change” war against Syria. The critics have never forgiven Obama for accepting the Russian proposal to use the occasion to rid Syria of its chemical arsenal, instead of overthrowing the Syrian government. But in recent weeks, as the Hillary Clinton campaign grows more frantic, Obama himself has joined the War Party. Those are the words of a six-year-old boy – a young child you has not learned to be cynical, or suspicious, or fearful of other people because of where they come from, how they look, or how they pray. We should all be more like Alex. Imagine what the world would look like if we were. The little boys are very cute, very sweet. Fortunately, Omran Daneesh’s parents are alive, so there is no need to adopt him. Many other children are dead, notably in Yemen, killed by Washington’s ally Saudi Arabia with arms provided by the United States. Too late to adopt them. “We should all be more like Alex”, Obama tells his good people. Imagine indeed, if all Americans were as innocent and naïve as six-year-old children. And indeed, that seems to be the goal of government propaganda. This propagandistic heartstring tugging is aimed at distracting from U.S. involvement in a long-term joint criminal enterprise to overthrow a government that indeed did not discriminate against people because of “how they pray”, and replace it by fanatics who are ready to behead people because of “how they pray”. An infantilized public will believe that “geopolitics” and “national sovereignty” are just big words that don’t mean anything. An infantilized public will believe that when the United States goes to war, it is all about protecting little children from their bad, mean dictators, whose only aspiration is to “bomb their own people”. They will believe that the world out there is Little Red Riding Hood, threatened by the Big Bad Wolf, and that there really is a Santa Claus. It will never occur to an infantilized public that the war to destroy Syria has been planned for years – even though someone like General Wesley Clark revealed this years ago. Or that it is carried out to eliminate Israel’s enemies, keep Arabs busy killing each other, and incidentally help Saudi Arabia spread its Wahhabite fanaticism. No, that will never occur to them. They won’t even notice that the Obama administration has now effectively given up any effort to justify the Nobel Peace Prize so foolishly bestowed on the apprentice president, and is now engaged in a scenario designed to prepare for Hillary’s next successful regime change war in Syria. And it won’t occur to them that the photo of the little boy in the orange seat was quite deliberately iconized by Western media as part of the campaign promoting the Islamic rebel-connected “White Helmets” for the future Nobel Peace Prize. Another subtle step in demonizing the “Assad regime” before Hillary takes over to administer the planned coup de grace. The future chuckler-in-chief is looking forward to seeing another head fall. This is called “smart power”.